As you may or may not know, Lonny’s Smile was entered in Tangerine’s #Tangerine20 contest and we have just received news that we have been selected as one of the top 20 finalists — out of nearly 400 entries across Canada! The full list was just released and now the race is on! Winners are determined based on votes so we are asking if you would please take a minute and vote Lonny’s Smile as every vote counts! It would mean so much to us! The top prize is $20,000, which would send lots of deserving kids with congenital heart disease to camp this summer! We encourage using the hashtag #Tangerine20 on social media as well! 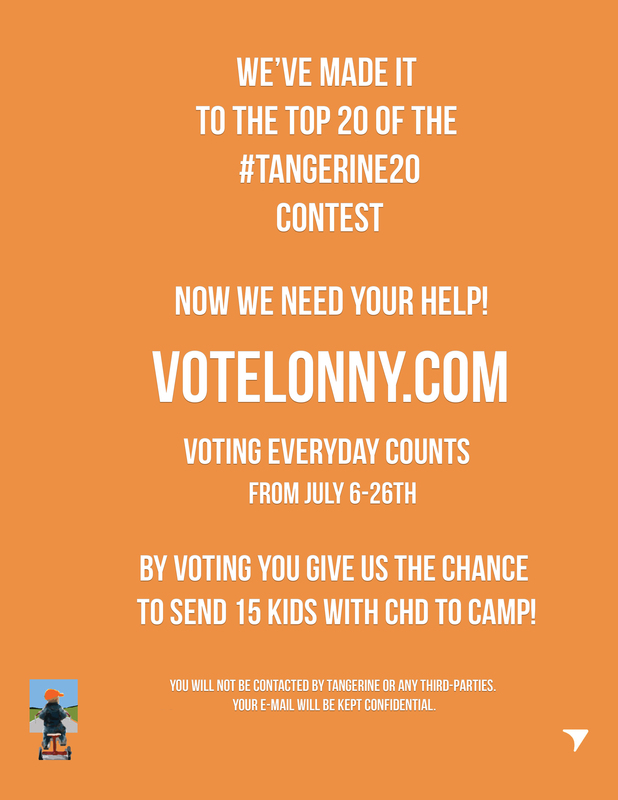 You can vote up to once a day from now until July 26th using your email and by entering your email you will not be contacted by Tangerine or any third-parties and your e-mail will be kept confidential.